Since I've just joined I thought it would be polite to bring something to the party. A couple of days ago I stumbled upon the rules to Imperial Contest. This is probably the first commercial tafl game; Jaques of London (of Staunton chess piece fame, and still going) must have found the rules from Linnaeus' 1732 diary, as translated by J. E. Smith in 1811, and turned them into a commercial game in about 1855. They had their own ideas of how to balance things. The image scans I found are copyright (which I respect) and heavily watermarked (which I do not, as it has made difficult reading). But the text is long out of copyright, so I've transcribed it and put it on my tafl site [link not working], along with a diagram that I've redrawn from the scan. Some other interesting things, though: as well as their attempts at balance, some of which are still used and some not, there are some press reviews (favourable, as these are their printed rules). They and the press recognised back in 1855 that the apparent imbalance lessens as the players become more experienced, a theory we've picked up again in the last decade or so. And be sure to read the amusing Spectator review which comments on the originality of the game. cyningstan wrote: A couple of days ago I stumbled upon the rules to Imperial Contest. This is probably the first commercial tafl game; Jaques of London (of Staunton chess piece fame, and still going) must have found the rules from Linnaeus' 1732 diary, as translated by J. E. Smith in 1811, and turned them into a commercial game in about 1855. They had their own ideas of how to balance things. 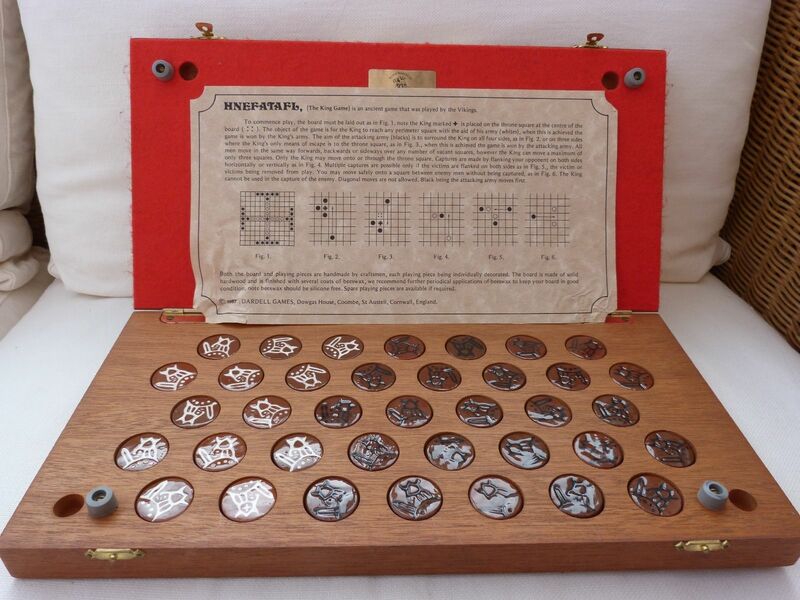 - In Imperial Contest, the first player is determined by lot. - In Imperial Contest, only one piece can be killed per move. - In Imperial Contest, the Emperor cannot move more than FOUR squares at once. 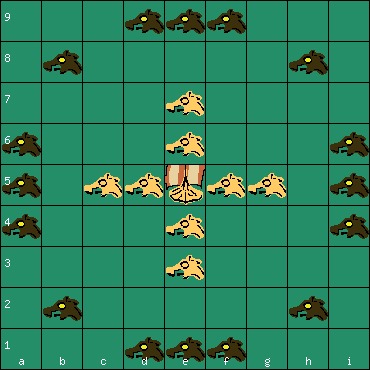 We found from a test tournament that the Sea Battle tafl 9x9 favours the defenders slightly (balance +1.21). The limitation on the Emperor's movement on the other hand favours the attackers to some degree, so Imperial Contest could very well turn out to also have a good balance, perhaps even better. Seen as a Sea Battle game, a limitation on the movement of the cargo ship can be explained, since the cargo ship must be more plump and heavy while the dragon ships are slim and fast. The four squares limit is well chosen, since this precisely allows the Emperor to move directly from center to edge. 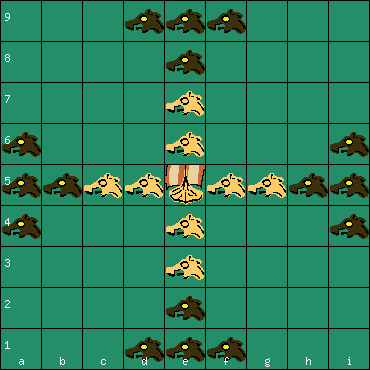 An interesting branch to this story might be Imperial Contest, which is almost the same game, with the additional rules of a 4-square maximum move for the king and capture of only one piece at a time. I'm not sure if it had any influence on later weaponless king games, but it predates them by more than a century. Last edited by Hagbard on Tue Apr 18, 2017 9:18 am, edited 1 time in total. 1) The Dardell board has a throne square, and only the king can move onto or through the throne square. 2) The Dardell king can move a maximum of only three squares. 1) helps the king, and 2) helps the attackers. If both details 1) and 2) are removed from the Dardell rules, we have the Sea Battle 11x11, which has an extremely fine, measured game balance of +1.07 (107 defenders' wins per 100 attackers' wins).